Unfortunately, I can be a bit of a perfectionist. A lot of times I will plan on putting something on the blog and after making it decide that it is just not tasty enough to share. After all, I am putting my personal endorsement on all the items on here, and I don’t want to lose your trust. Other times I will make something that is delicious but so un-photogenic that I can’t seem to get a nice picture of it, and I don’t want get some kind of ugly photograph reputation. Well in an effort to worry less about the small stuff, I decided to post this recipe even though my camera was just not cooperating with me. 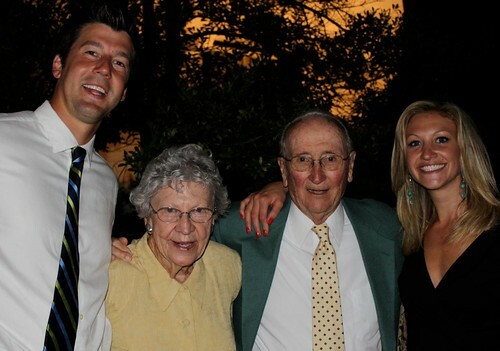 It should tell you something that I thought it was special enough to share even without a perfect picture. I would describe this as a comfort food dinner. It’s especially handy to have in the recipe repertoire because it uses ingredients that I can store in my pantry or usually have on hand. 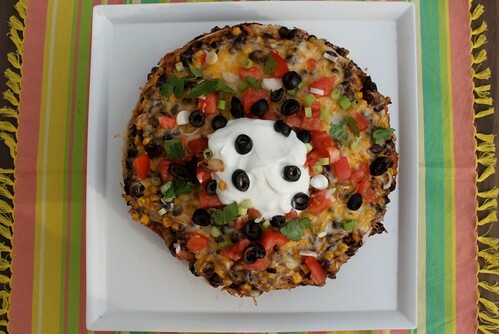 I thought it was just going to turn out like a bunch of flour tortillas layered with beans, but something magical happens in the baking process. The cheese melts and the tortillas soften, and the whole thing solidifies into a concoction that actually does seem like a pie. For some reason I didn’t think about the fact that there is a lot of food going into this “pie” and it is way more than John and I could even try to eat. This is a filling pie, so I’m definitely adding it to my list of good dinners to make for company. 2. In a large saucepan heat oil on medium-high heat. 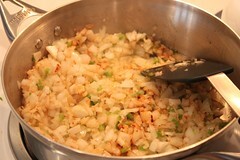 Add the onions, jalapenos, garlic, cumin, chili powder and salt and pepper. Cook until softened, about 6 minutes. 3. 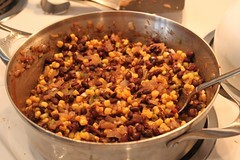 Add in the black beans, scallions, salsa and water, and stir until well mixed. Bring the mixture to a boil, then reduce heat to medium-low to simmer. Continue to cook for about 10 minutes, stirring regularly, until most of the water has evaporated. 4. Once water has evaporated, remove pan from heat and add in the frozen corn and scallions. Mix to combine. 5. Lay a flour tortilla in the bottom of a 9-inch springfoam pan. 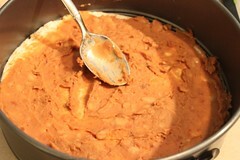 Spread the tortilla with about 3 T. of refried beans. 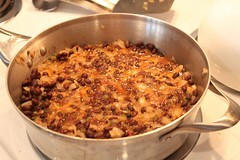 Then continue layering by spreading about 1 cup of bean mixture on top of the refried beans. Top the layer with 1/2 a cup of shredded cheese. 6. Repeat this layering with the 3 remaining tortillas. 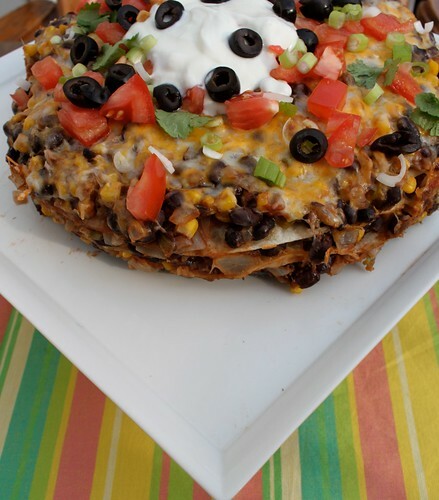 On the top layer, cover the beans generously with cheese. 7. Bake the “pie” for 20 minutes, or until the cheese is melted. Remove the sides from the springfoam pan, and top with garnishes of choice. Slice into wedges and serve warm. This entry was posted on July 19, 2011 by Spice Is Nice. 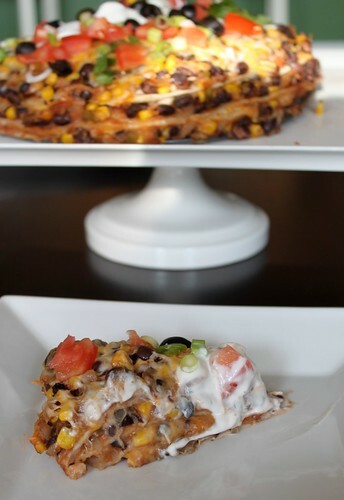 It was filed under Main Dish, Vegetarian and was tagged with Bean, Cheese, Comfort Food, Corn, Mexican, Pie, Salsa, Tortilla.